For many student housing operators, rent rates are the key to driving occupancy. In a push to achieve occupancy goals early in the perpetual student housing lease-up, operators typically plan rental rate tiers tied to three key dates on the calendar — before holiday break, before spring break and after finals. While this calendar-driven approach often does lead to the desired occupancy, it usually leaves money on the table because it prioritizes occupancy over revenue. In our experience, it’s possible to achieve occupancy goals while also driving optimal rent for every bed in every unit when following a price setting strategy based on revenue management. 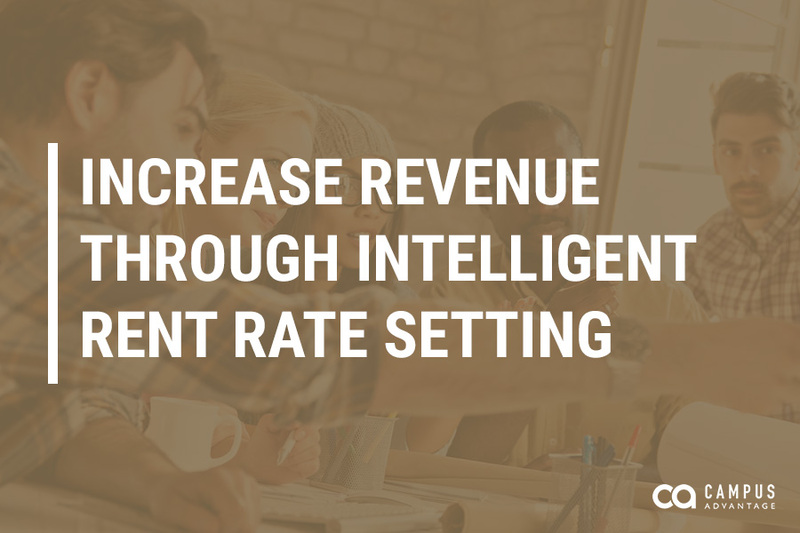 Enabling the regular review of this data, a revenue management software can measure leasing velocity demand against expectation while indicating inflection points where performance is not meeting expectations, which is key to operational efficiency. Utilizing a revenue management strategy may lead to circumstances that are uncomfortable at first – like NOT adjusting rates along side competitors. But the results are worth it. In fact, a 2016 study conducted by Yieldstar using NMHC (National Multifamily Housing Council) benchmarks demonstrated that properties using a revenue management approach to rent rate setting drove 2x year-over-year revenue growth as compared to properties utilizing a standard pricing approach. With better line of sight into supply and demand, student housing rent rates act more like airline ticket rates: you could have four different residents paying dramatically different prices depending on supply and demand factors at their specific time of lease up. In fact, despite traditional expectations, a three-bedroom unit might rent for more than a four-bedroom unit, if demand allows. Campus Advantage began using a revenue management approach nine years ago, at a time when it was completely unheard of in the student housing space — but in 2018, others in the industry are starting to follow suit. While making the shift to revenue management can be challenging to operationalize for first-timers, the results are worthwhile. For Campus Advantage managed properties, results include an average 5.4% effective rent rate increase portfolio-wide. Set in stone through consistent training and the focus of senior management, a revenue management platform will encourage site-level staff to keep a close eye on pre-leasing velocity and effectively recommend necessary price adjustments. In addition, restructuring the on-site team’s bonus potential to factor in revenue and NOI will further incentivize the team to adopt a revenue management platform to the benefit of the entire student housing operation.